[00:23:14] <jdhNC> can you un-route in eagle? [00:23:42] <jdhNC> so once you route, you are stuck? [00:24:24] <SWPadnos> the real question is, should I go to Germany tomorrow so I can hear my nephew sing in a contest? [00:25:19] <jdhNC> but, I don't care that much for my nephew, germany is a long way away and he can't sing. [00:33:16] <robin_sz> mmm. same part, alternative package? [00:34:24] <jdhNC> I'll just delete the board and start over on it. [00:34:59] <factor> I just use the radio shack boards initially until I get what I want , since I change it up . [00:37:47] <robin_sz> are there modbus simulators? [00:38:00] <robin_sz> dummy things that will sit there and pretend to eb a real bit of kit? [00:40:14] <jdhNC> and ported some linux libmodbus stuff to a vax to talk to it. [00:40:42] <factor> I have to reinvent the wheel so I can understand it from bottom up. [00:41:01] <factor> if someone else invented the wheel, does not mean I now know how to invent the wheel. [00:43:25] <elmo40> SWPadnos: I have nothing but time! [00:44:02] <elmo40> meh, haas... people still buy them? [00:44:39] <elmo40> did you pay for the macro options? coolant through spindle? [00:54:05] <factor> less out sourcing. [01:17:39] <jdhNC> oh,that's what all those are for. [01:22:36] <jdhNC> this keyboard has tiny recessed Fkeys, makes this harder than it should be. [01:49:17] <AC-130H> has anybody ever played around with nanoPLCs? [02:11:52] <skunkworks_> AC-130H: what for? [02:39:29] <skunkworks_> for a cnc? [02:40:26] <Tom_itx> jdhNC, what's this board you're working on? [02:43:51] <jdhNC> want to take a look and tell me what I should have done? [02:44:17] <jdhNC> what do I send? [02:44:23] <jdhNC> just the .brd and sch? [02:55:43] <jdhNC> did that work? [03:07:12] <jdhNC> where do you set that? or do you do it by hand? [03:12:30] <jdhNC> what's the difference between net and bus? [03:14:33] <L33TG33KG34R> anyone know of a servo that holds its position like a linear actuator when powered off? [03:19:16] <L33TG33KG34R> for flaps and stuff. [03:24:31] <jdhNC> oh, then you pick which one to connect to? [03:26:38] <ds3> jdhNC: in what area? [03:27:59] <L33TG33KG34R> i know it will but the force put on is low. [03:31:33] <jdhNC> where is the net icon? I just used f9? [03:35:55] <jdhNC> thanks for the help... later. [14:26:52] <CapnKernel1> Hello. I just got one of the common 3-axis TB6560A stepper motor driver boards. During testing, is it safe to just connect up one stepper and leave the other two disconnected during testing? [14:29:22] <CapnKernel1> I have a hand controller for it. If I press axis movement buttons, and there's no stepper attached to that axis, is that harmful? [14:31:30] <cradek> is it pronounced like gerbil? [14:32:25] <CapnKernel1> I think so, but I must admit I don't know whether gerbil has a hard "g" like "gerber" or a soft "g" like g-code. [14:34:17] <CapnKernel1> cradek: Do you know what an Arduino is? [14:39:01] <CapnKernel1> It's g-code-to-stepper-motor software that runs on an Arduino. [15:16:11] <CapnKernel1> I have a question about the limit switches on my TB6560A 3-axis stepper driver board. It says there are four inputs for limit switches and estop, on a 5-pin SIL connector. Any ideas on the pinout of that connector? [15:17:48] <cradek> there is no standard; you'll have to find documentation about your driver board specifically. [15:26:12] <CapnKernel1> Unfortunately I think I should have got the three axis one, as I don't seem to be getting any joy. [15:28:23] <CapnKernel1> I believe it has a micro inside it which generates step/dir pulses for each axis, according to what buttons are pressed. [15:29:09] <CapnKernel1> I'm not a fan of the big bang approach, I like starting as simply as I can and working up from there. [15:35:16] <Connor> jdhNC: Got a Call this morning. Mill due to me delivered tomorrow. [15:35:51] <archivist_emc> now you have to tidy some space! [15:36:01] <Connor> I've had time. [15:36:24] <Connor> Space is good to go. moved my Radial Arm saw out.. Just need to sweep and vacuum. I do need to clean my workbench..
[15:37:01] <Connor> Made a nice MDF box to hold my vacuum and put my benchtop drill on.. Have enough room to add in a drawer which I think I'll do. [15:37:33] <Connor> need to vent the box outside so the vacuum can run without overheating... and get me a Dust Deputy for it. 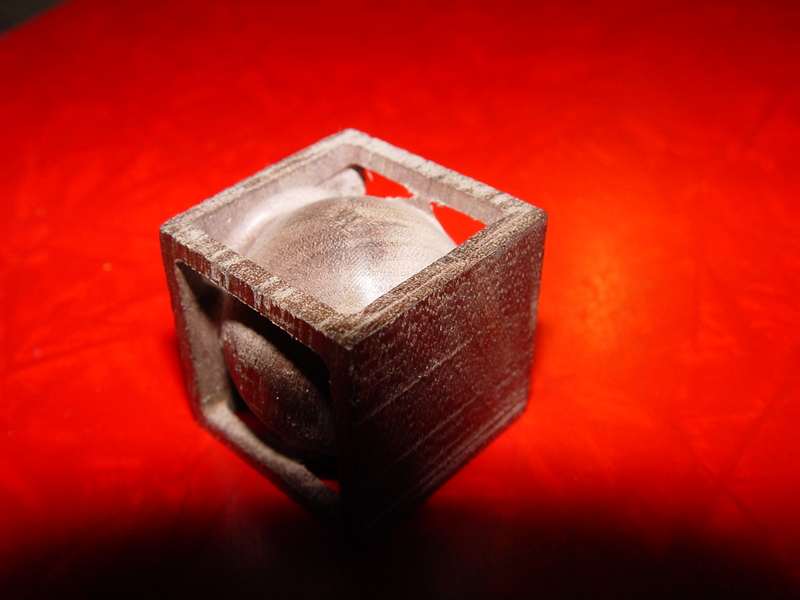 [16:00:06] <cpresser> did anyone here try to run an extuder (lie reprap oder makerbot) with emc? [16:01:18] <skunkworks_> the only one I know of that is on here is awallin. I have seen others do it though. [16:04:02] <cpresser> are you using skeinforge to generate the gcode? [16:05:48] <cpresser> how do you home your A-Axis? [16:07:19] <TekniQue> awallin: ok, what's with the huge gears on your extruder? [16:11:49] <cpresser> i already had SEARCH_VEL=0, but axis did complain that MDI-Commands can not be run until all axis are homed. [16:12:30] <awallin> the AXIS home-button(s) might be hidden if actual home-pins are connected in HAL? [16:12:40] <cpresser> ill redo the axis configuration..
[16:13:16] <cpresser> awallin: how do you controll the extuder temperature? [16:19:11] <cpresser> mine is more complicated.. I generate a triangle-wave and compare it with the temperature to generate a pwm. [16:21:00] <awallin> I don't think the temp-control needs much accuracy anyway. A heated bed is something to think about also. [16:22:48] <ds3> awallin: you are doing a EMC2 controlled 3D printer? [16:22:55] <cpresser> i was thinking of using a hot plate (induction) as heated bed. [16:23:48] <ds3> awallin: which extruder? [16:25:52] <ds3> what did you do for the gear? laser? cnc? someone else printed? kit? [16:30:19] <cpresser> i build mine with parts bought from makerbot. [16:42:27] <willburrrr2003> After I re-installed my Ubuntu and upgraded my emc to 2.4.6 , I pasted my config folder back into it's emc folder. When I try to generate code from my NGCGUI it fails unable to write the auto.ngc file. Tells me the directory doesn't exist. Do I have to add the directory to a path file somewhere for it to be known by the system? [16:44:36] <JT-Shop> did you put the ngcgui files in the same directory as your ini file? [16:45:37] <JT-Shop> does it say what directory doesn't exist? [17:07:03] <Connor> IchGuckLive: Been hot for the past 10 days.. above 90+F. It's been around 98 for the past two days..
[17:07:15] <Connor> humidity is high too, so it feels hotter. [17:49:54] <tom3p> xmpl code iterates thru pose structures in #1000 thru #1999. [17:59:05] <IchGuckLive> is there a parametric example for a HalfBall like shape ? [18:06:04] <skunkworks_> probably not exactly what you want..
[18:08:46] <skunkworks_> never did finish one..
[18:10:44] <willburrrr2003> IchGuckLive: do you teach machining? [18:13:19] <willburrrr2003> way cool :) could you recommend for me a good text for learning how to program a cnc lathe? [18:30:42] <pingufan> 1. The mainboard uses OnBoard graphics (Via Epia M with Via C3 1000 MHz CPU). Right of the coordinates of the machine (in AXIS) I see a scrambled area yellow and black stripes. Below it works, but a 8mm wide vertical area is always black in the AXIS display. [18:31:28] <pingufan> 2. I have some questions on G-Code (I code really manually) I will ask later. [18:31:36] <pingufan> Can somebody, please, help? [18:32:57] <cpresser> pingufan: are you using the vesa-driver? [18:33:18] <pingufan> Yes, I think so. [18:34:13] <pingufan> I can take a picture and show you how it looks like. [18:34:34] <pingufan> Want to see it? [18:37:10] <pingufan> Booting the PC - Needs a while. [18:38:07] <pingufan> Btw., this mainboard (EPIA M 10000) seems to prefer old way APM. Does Ubuntu support that? [18:41:03] <pingufan> Uploading pictures right now. [18:46:09] <pingufan> Notice the black bar through the "M" of EMC2 and the distorted area in top of AXIS display. [18:46:30] <pingufan> Everything else displays perfectly. [18:48:05] <pingufan> And the whole system works stable then? I also have amarok playing musik while I mill, etc. [18:48:59] <pingufan> When the window of EMC is not maximized, it displays correctly! [18:49:50] <cpresser> even when manualley resized? [18:53:00] <cpresser> so, you can scale the window to 'almost fullscreen' and eveything is fine, but not if you actually hit the maximize-button? [18:54:51] <pingufan> I tried that now more precisely. When I slightl increase the window size, the black bar appears. When I increase its size a bit more, the upper area gets distorted in addition. [18:56:57] <rooks> is there some GPL like licence for real life manufacturing? [18:57:38] <pingufan> My thoughts: When I use VESA, the whole screen is mapped in RAM. Right? So when the whole desktop is fine, but the distortions move(!) with the window (when I move the EMC window across the screen), so how can this be a hardware issue? [18:58:57] <pingufan> The problem only appears inside the AXIS window. [18:59:38] <cpresser> everyone can also build it for free, but not sell. [18:59:39] <pingufan> Btw., how can I get EMC start in FullScreen mode? [19:02:29] <pingufan> Other issues: I would like to use my mouse as "emergency button". When I press left+right button simultaneously, the mill shall immediately rise the tool to maximum "Z" and then stop. Is this possible? [19:03:28] <pingufan> But still better than trying to click the stop icon. [19:05:05] <pingufan> Well, when I mill in acryl, the last thing I need is a stopping cutter inside the workpiece. It shall be retracted first. So x/y motions shall immediately stop, z shall do a "g53 g0 ymax". then everything can stop safely. [19:05:59] <pingufan> Not a real Estop. When I see that something is wrong (this is a little mill), I want to be able to stop it before something happens. [19:06:44] <FinboySlick> Hello gang. Any ideas for a ghetto tachometer that would give let me sample between 8k and 25k rpm? I remember an old trick where you'd just watch a black/white pattern lit by a fluorescent light but I'm not sure if it would scale that well. [19:07:02] <pingufan> It is an emergency to me when I must get afraif that the tool breaks because it is inside melted acrylic. [19:07:31] <cpresser> rooks: CC licence has all options you need. [19:08:28] <pingufan> So I cannot trigger a predefined G-Code sequence in case of a mouse event? [19:08:49] <cradek> no, not easily. [19:09:16] <pingufan> Ok. What can be done easily? [19:11:50] <pingufan> cradek: Can a input pin (from parallel port) be used to trigger a predefined G-Code sequence? [19:12:36] <FinboySlick> Buying one (especially capable of those speeds) for a single measure seems a tad wasteful. [19:13:01] <pingufan> Do you have a frequency counter? [19:13:09] <cradek> JT-Shop: slightly slower speeds I guess! [19:13:53] <FinboySlick> pingufan: I have an arduino board, maybe I could code one in. I'm just not sure what to use as a sensor. [19:15:01] <pingufan> Reflective lightbar (infrared). emits IR-light and has a sensor besides. [19:15:04] <FinboySlick> cpresser: don't these have hundreads of slots? [19:16:05] <FinboySlick> Yeah. I'll have to be careful on the setup though, even at the low end, this thing could throw something across the room pretty quick. [19:16:50] <FinboySlick> II could make the wheel out of paper. [19:17:28] <pingufan> And let a thin fin of paper pass through the fork. [19:18:53] <FinboySlick> pingufan: I'll go mouse hunting. [19:19:30] <pingufan> You have mice? [19:19:56] <FinboySlick> Well, as in the computer thing. The organic ones don't survive my cat. [19:20:06] <FinboySlick> I'm also a bit worried that my cat isn't scared of the mill at all. [19:21:39] <pingufan> Ok. What I actually would need is: STOP Interpreter without stopping the spindle, then do a G0 Z60, then stop the spindle, too. [19:21:46] <cradek> you don't need an mdi command to go up. easier would be to use jogging after abort. [19:22:23] <cpresser> it would be possible to do it in hal via "postion-cmd"
[19:23:20] <pingufan> Whow. Sounds impressive. I understand absolutely nothing. [19:24:52] <pingufan> I think I will live with the current situation. All that seems to be very complicated to me. [19:25:20] <pingufan> But such things would be very useful for EMC in gerenal. [19:25:40] <FinboySlick> Someone was asking me if EMC would interpret code generated by HSMWorks. Anyone here knows? 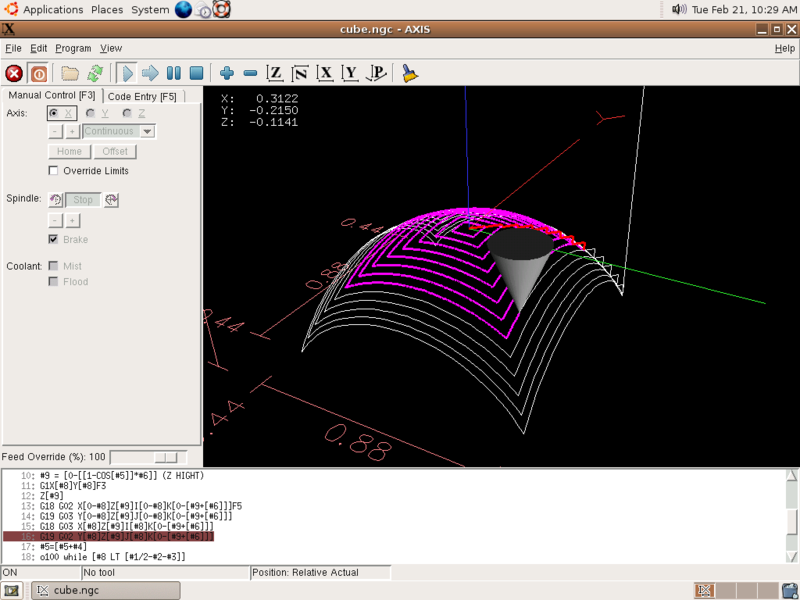 [19:26:24] <pingufan> Is someone here generating G-Code out from EAGLE cad 5.x (on Linux!) ? [19:27:15] <FinboySlick> From what I understand EMC is pretty close to NIST standard so I was tempted to guess 'yes' but I have no clue what postprocessors HSMWorks uses. [19:28:15] <pingufan> Paragon39: Yes. The nut seems to operate a linear potentiometer. [19:28:49] <pingufan> There is one, but I also read that this is only in Windows. Did I mis-understand? [19:31:05] <pingufan> How can I make that EMC2 starts automatically in fullscreen? [19:31:33] <pingufan> Yes, pcbgcode is claimed to run only on Win. [19:33:51] <JT-Shop> skunkworks_: the mailing list? [19:33:54] <pingufan> Thank you. Very kind. [19:36:15] <pingufan> Only for understanding: I have to insert all three lines of the second block to get full screen? [19:36:44] <Paragon39> pingufan: I was thinking more along the lines of how it produces the that much force feed back and the mechanical aspect of it. [19:39:49] <pingufan> JT-Shop: It is funny, It gets then the maximum height, but not the maximum with. Anyway, it is much better. [19:41:03] <pingufan> Ah, it is fine as it is. I miss ~4mm only. [19:43:13] <pingufan> Can one explain me "peck drilling"? Show me a code to drill a relative depth of 5mm? (assume g91 was already done and I am at start position). I couldn't find a good description. [19:44:04] <skunkworks_> I was thinking of doing a spiral..
[19:45:48] <pingufan> Oh, I must leave. Have a nice evening. [19:54:45] <tom3p> i see, more than 360 degree in a arc, thx! [20:00:49] <JT-Shop> how critical would the orientation of the rods be? [20:19:07] <tom3p> does A rotate around Z? and B around ... Y? [20:23:16] <tom3p> does the scallop stay same height? [20:41:59] <Tom_itx> JT-Shop, are you making one of those probes? [21:24:37] <archivist_emc> "drawn on the back of an envelope"
[21:25:35] <jdhNC> err.. not here. [21:29:57] <Tom_itx> what is 12L14? is that stainless? [21:31:34] <Tom_itx> did he use ball bearings or something else? [21:32:52] <tom3p> but the ruby tipped probe, any cheap finds for that? [21:53:39] <FinboySlick> I can just use a microphone and record it. [23:41:41] <Tom_itx> what's the cost of an M3 tip? [23:42:16] <ds3> M3 tip? what's that? [23:48:01] <ds3> $40 for a 3mm dia ruby ball?